A new study indicates alarming poverty, abuse, and suicide among Native Americans. As Native Americans celebrated Indigenous Peoples Day last week (the reclaiming of Columbus Day that's taken root in recent years), the National Gay and Lesbian Task Force and National Center for Transgender Equality released the fourth and final piece in a series of reports designed to specifically shine a light on the experiences of transgender people of color. Injustice at Every Turn: A Look at American Indian and Alaskan Native Respondents in the National Transgender Discrimination Survey measured transgender people's experiences of discrimination and showed that the combination of anti-transgender with structural and individual racism meant that transgender people of color experience particularly devastating levels of discrimination. • American Indian and Alaskan Native transgender and gender non-conforming people often live in extreme poverty with 23% reporting a household income of less than $10,000 a year. This compares to a rate of 15% for transgender people of all races. It is about three times the general American Indian and Alaskan Native population rate (8%), and nearly six times the general U.S. population rate (4%). • American Indian and Alaskan Native transgender and gender non-conforming people were affected by HIV in devastating numbers: 3.24% reported being HIV positive and an additional 8.53% reported that they did not know their status. This compares to rates of 2.64% for transgender respondents of all races, and 0.60% of the general U.S. population. 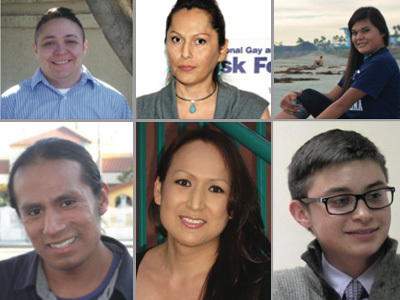 • Fifty-six percent (56%) of American Indian and Alaskan Native transgender respondents reported having attempted suicide compared to 41% of all study respondents.